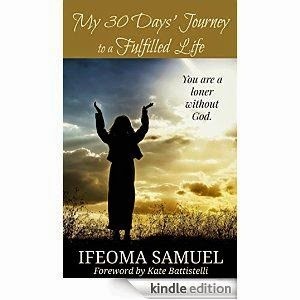 Today I will tell you about Ifeoma Samuel's Kindle book, My 30 Days Journey to a Fulfilled Life, that will be available beginning March 15. See below how you can win a free copy! She is graciously giving away 2 copies to my blog readers. Ifeoma's book focuses on fulfillment. It contains 30 chapters that covers different aspects of daily life. All chapters contain prayer prompts, practical activities, food for thought, and scriptural references. It provides insights into areas like relocating, de-cluttering, family values, time management and several topics that will help you prayerfully re-evaluate your entire life. It can be used as Bible study devotional for women. When asked why she wrote the book, Ifeoma responded, "to share life lessons God had taught me. God opened my eyes to see that 'living is not worth it if I merely exist." To order My 30 Days Journey to a Fulfilled Life on Amazon Kindle, click here. I'll be giving away two free PDF copies of this book to the first two people who contact me on the blog comments below, or via my email at juana(at)juanamikels(dot)com. I invite you to visit me at Harvest Lane Cottage .